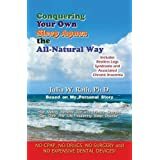 Conquering Your Own Sleep Apnea The All-Natural Way is for those of you who recognize that you have a major sleep problem but may or may not know what it is. You may have made the diagnosis yourself, or have had the help of a sleep partner or family member, or have had the diagnosis verified by a sleep laboratory–or not. Your symptoms may be clearly noticeable or extremely vague. Bottom line: You are suffering; you are tired; and you want answers. The book is also for those who want to handle sleep issues in a non-invasive fashion, privately, and inexpensively, without resorting to prescription drugs, CPAP machines, expensive dental appliances, surgery, and the like. If you are seeking alternative ways to treat your sleep troubles, try the methods in this book first! Like many of you, I was sick of my fatigue and desperate for rest. And for a long time, I was at my wit’s end to figure out how best to relieve my sleeplessness, breathlessness, anxiety, restless legs syndrome (RLS), and other dreaded symptoms. But over time, I discovered the secret to a better night’s sleep. What I write about is a conservative approach to treatment and prevention that I developed to deal with my own sleep troubles–that you can test out for yourself. It is not an instantaneous fix but involves some diet and lifestyle changes that are unique for each person. This methodology worked for me and could work for you too. In short, the knowledge being offered in this book can be of great benefit to you—and your loved ones—in your quest to end your nightly torment and take back your life.